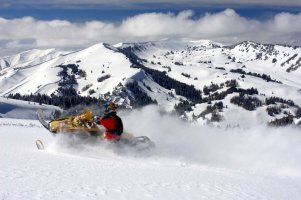 Salt Lake City Ski Resorts : An indepth guide to Salt Lake City created by the Salt Lake Tourism Center. Salt Lake City is home to a little bit of everything. Whether you're a first time visitor or you're here every month, our goal is to make your visit more enjoyable by providing updated information. You've heard and read about us for years, we are right next to Colorado, and offer the best powder in the world along with terrific options for your complete winter family vacation. With 7 different mountain resorts all less than 40 miles from our Salt Lake International Airport, you can visit all 7 during one weeks time. Profiles of our resorts and links to their official websites are listed below. Utah's ski and snowboarding resorts have been supplying the ultimate winter vacation destination since the world visited during the 2002 Olympics. 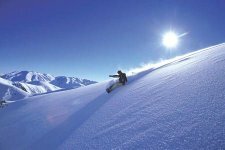 "The Greatest Snow on Earth": Utah's slopes are known for dry, light "powder"
Variety: Our six (6) Utah ski resorts offer very different experiences. Also, two are "ski-only", No Boarders, - a treat for skiers. Affordability: Families can stay in affordable Salt Lake City and ski or board at a different resort each day. Readers of Ski and Skiing Magazines consistently rank Alta at the top in the U.S. for powder, snow quality, terrain and value. Alta and Snowbird are often ranked together. This season Forbes ranked Alta/Snowbird the #2 Resort in the US, and the major criteria for the ranking was "Awesomeness!" Located just 40 minutes from the Salt Lake International Airport, Alta is one of the most accessible ski areas in North America. A locals favorite; no boarders, skiers only! Snowbird is located in the heart of the Wasatch-Cache National Forest in Little Cottonwood Canyon, one mile down canyon from Alta. Snowbird has an uphill capacity of 17,400 skiers and snowboarders per hour. The various lifts are: One Aerial Tram, 10 chairlifts including six high-speed detachable quads and four doubles (most with arm and leg rests) and one conveyer lift. Terrain is Brighton's trump card - and 100% of the terrain can be accessed by high speed quad. Perhaps it is the only mountain where friends or families can ride together on the same lift and then peel off onto different trails - beginner, intermediate, or expert - and all meet at the bottom to ride the lift together again. "Refined by Nature", Solitude Mountain Resort is located a short 40-minute drive from the Salt Lake International Airport. Solitude is one of Utah's most intimate and inviting winter resorts. Solitude also offers a Nordic Center with nearly 20 kilometers of trails set for both classic and skating styles of Nordic skiing. And don't forget Honeycomb Canyon, it has some of the most awe inspiring, lift-served terrain in the country. Two more resorts are accessed by taking Interstate 80 east from Salt Lake City approximatly 35 miles to Park City, an old mining town from 1800's. Historic buildings combined with the luxuries you would expect from a world class destination. Enjoy quality dining, quaint shops and a vibrant nightlife 365 days a year. A few years ago, the resort undertook the largest resort improvement project in the history of American skiing, one that linked it with neighbor Park City Mountain Resort to create the United States' largest ski area. 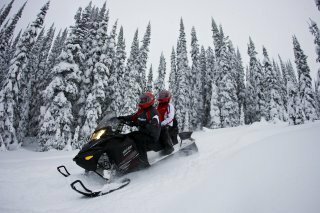 Deer Valley Resort is also consistently ranked #1 in the individual areas of dining, guest service and mountain grooming. Deer Valley is more than a winter resort, it's an experience. Since opening in 1981, Deer Valley Resort in Park City, Utah has become known for its revolutionary approach to ski area service. Committed to providing a level of care rarely found at a ski resort; delivering classic, consistent, and quality service both on and off the mountain. Skiing in Park City at Deer Valley is an event the whole family will remember. 99 Designated Trails: 7 bowls. 15% beginner, 50% intermediate, 35% advanced/expert. Cherry Creek is located 15 miles from Logan and will offer many options including night skiing. Discount Lift Tickets to Utah's Ski Resorts. Where To Rent Skis, Snowboards & Winter Gear. Here's where you can find all of the needed information to start planning your upcoming Salt Lake Visit. We feel these categories and services will point you in the right direction from our trusted members. When you do Visit Salt Lake, bring us along on your mobile device, our goal is to make your visit more enjoyable by providing updated information. This website is updated daily.